Home › Sociology › gender & feminism › Get your submissions in now for the Down Under Feminists Carnival! 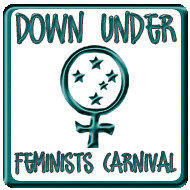 Get your submissions in now for the Down Under Feminists Carnival! No real theme, but I’m especially on the look-out for sassy posts by sassy people. The submission form is here. If you can’t access the form, you can use the Hoyden contact instead. Submissions due by 30 November – so get them in by the end of the weekend. Thanks for putting the word out! john cramer, you’re huh-huh-huhlarious. Run along now.